Experience a Taste of Burning Man, at 2017 Decom Art & Music Festival in Downtown LA on October 14! Transformation is something we all strive for in our lives. Each year, people from all over the world gather in Nevada seeking their own profound experiences at a global phenomenon named Burning Man. The extravagant art fest attracts creative types and allows its attendees to let loose from the confines of everyday life. Longtime “Burner” Deb Stiers has been attending BM since 2002 and revealed that she has experienced life changing moments at the event. 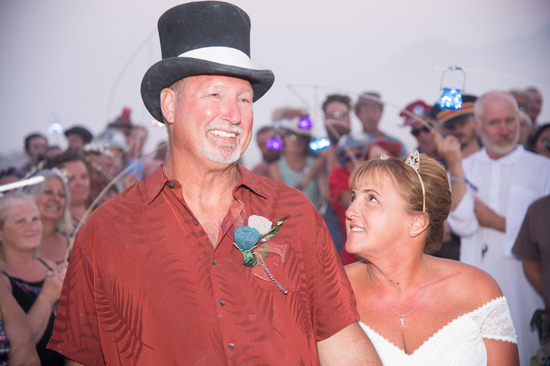 Just a few weeks ago, she married the love of her life at Burning Man which is fitting, since it is where they met in 2015. Now, as one of the co-producers of the Los Angeles Burning Man Decompression Art & Music Festival, (created to help Burners “decompress” after the big festival), she invites people to experience their own transformation. Not knowing what to expect at her first burn in 2002, Stiers said she was completely unprepared for the culture of BM. “BM was incredibly liberating my first year. I experienced a freedom and sense of independence that I had never known existed.” BM stresses that attendees give back, be inclusive, and pay it forward, something that Stiers wanted to experience as soon as she entered the city…so she volunteered to become a greeter – which she does to this day. She has become much more involved on every level, with both Burning man and the Decom Arts & Music Festival (in LA), dealing with volunteers (1500 plus), logistics, infrastructure, and ticketing. She is a founding board member of the Los Angeles League of Arts, which sponsors the Decom event. Two years later, they decided to tie the knot at the very event that changed both of their lives. With the help of their friends and family, they chose to have the ceremony at the Greeters Station, and in true BM fashion…it was open to anyone that wanted to attend. Experience a taste of Burning Man at the 13th Los Angeles Burning Man Decom Art & Music Festival on October 14, 2017…it may just change your life. The event runs from 1-11pm at the Los Angeles State Historic Park, located at 1245 N. Spring St. 90012 Los Angeles, CA. Admission is $20 per person (cash only) at the door, with no re-entry after 6 pm. ATMs will be set up at the gate. Enjoy a cash bar, food trucks, performances on four stages. Children under 12 are free. Attendees are encouraged to take the metro since it is next to the Chinatown Metro Stop. There will be paid parking ($10) on the site. Ride sharing and mobile car services are encouraged. Visit the website at http://www.ladecom.com or check the 2017 Decom FB Event Page for the latest up-to-date info. See the LA State Historic Park FB Page to find out about the newly renovated park.